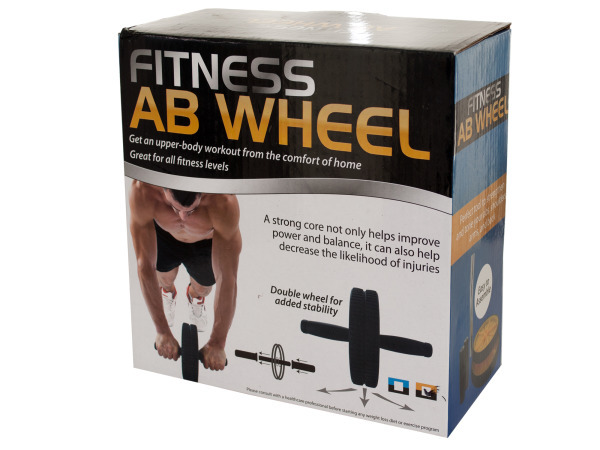 Get an upper-body workout in the comfort of your home with this easy to use Fitness Ab Wheel, the perfect tool to strengthen and tone your abs, shoulders, arms and back. Great for all fitness levels. Simply hold in a push-up position and roll the wheel back and forth. Features non-slip handles and a double wheel for added stability. Also comes with a cushioning floor pad. Made of durable plastic with a strong metal axle. Easy to assemble. Measures approximately 12" x 7" x 2". Comes packaged in an individual box. Package measures approximately 8" x 8" x 3.75".